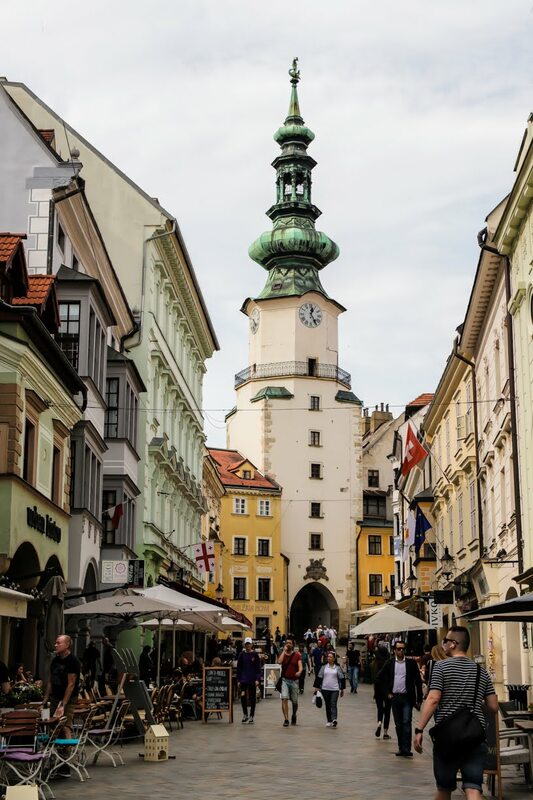 Atmospheric churches, cool new cafes, quirky museums and statues, and all the cobbled-fairytale beauty of your typical medieval European city are hallmarks of central Bratislava, Slovakia. This is an intimate, easy-to-navigate city of around half a million inhabitants and one of the youngest capitals in Europe, but it is actually a city with a long history. As with most European cities, it is the Old Town that has the main appeal so my wife and I spend most of our time exploring the cobbled pedestrian streets and hotchpotch buildings that make up this area. There are a variety of lovely little shops, cafes and eateries, and every so often we come across a beautiful church or spacious square. This New Gothic-style building was built in its current form in 1452 and features stunning Gothic stained glass windows. Eleven Hungarian kings and eight queens were crowned in this remarkable Cathedral between 1563 and 1830. In the gracefully refurbished Bratislava City Museum I learned about some of the city's history. There is a chapel dedicated to a Hungarian king and a map of Vienna from 1430 showed Bratislava as almost a suburb of the Austrian capital. With the Turkish occupation of much of Hungary after 1526, Bratislava then served as the Hungarian capital for some three centuries. Bratislava's Old Town Hall complex dates back to the 14th century, making it one of the oldest stone buildings still standing in the Old Town. Climbing to the top of the clock tower (which dates back to 1370) provides a panoramic view over the main square and Old Town. The Apponyi Palace next to the Old Town Hall has a Museum of Viniculture. Pay a fee and a sommelier will make recommendations about which wines to try. There is also a Period Rooms Museum upstairs. This pretty pink palace was built in 1778 for Archbishop József Batthyány. Today, you can experience the historical grandeur of the palace by visiting the second floor with its stunning Hall Of Mirrors. If you don't want to go in take a seat in the small square in front of the palace and view the building topped with allegorical statues. Originally built in the 14th century, many modifications have been made to the gate over time. The tower now houses Bratislava's Museum of Arms. We climbed the 110 steps leading up to the top of the tower which was part of the original city fortifications and the only bit remaining. 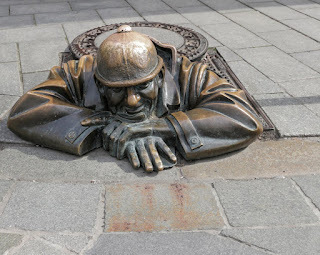 Bratislava's has a few funny statues with Cumil by far the most famous. He's a bronze representation of a man who is working in the sewers and has just popped his head up to get some fresh air. We walked to the imposing Victory Gates of white Bratislava Castle. It is decorated with military sculptures and provides incredible views of the city stretching below you. The oldest part still standing is the Crown Tower that dates back to the 13th Century. You can also stroll through the Baroque gardens and enjoy a beer or coffee at a picturesque cafe overlooking the Old Town. 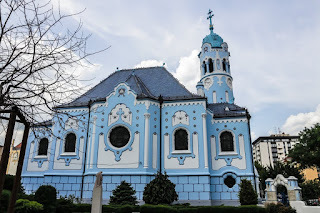 This nice church is very blue. Even the roof tiles are blue. With a fabulous Art Nouveau facade featuring flowers and whimsical white details, the church is just outside the Old Town but is worth seeking out. This is so called because it's set in a spaceship shaped building on the pylons of the SNP Bridge 95m above the Danube. The views are spectacular, particularly at sunset. In summer you can join the locals nearby at Magio Beach, a public area, with imported sand and a fun atmosphere on sunny days. You can't swim in the Danube, but you can swim at the pool located near the bar. You can also play a game of beach volleyball in the sand. For something special, catch an evening opera performance at the Old Building of the Slovak National Theatre in the centre of the Old Town. The Neo-Renaissance building exudes old-fashioned charm and dates to 1886. To reach Devin Castle it's under half an hour by car, or in the summer months, there are boat trips you can take along the Danube. The ruined cliff-top castle itself is impressive, then visit the Maiden Tower, separated from the main castle and balanced on a lone rock. 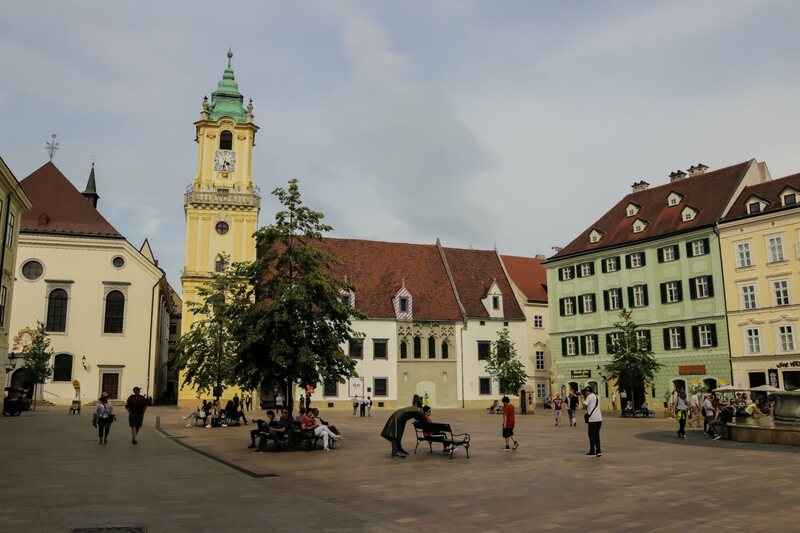 Visitors should consider the Bratislava CARD which gives free admission to 14 museums and galleries, a free 1-hour walking city tour in English held daily at 2.00 pm, and unlimited travel on the public transport network in all zones in Bratislava and the Bratislava Region. A one-day card costs 15 euros.